Granddaughters are a precious gift, and there is no better reason to celebrate than the annual reminder of their presence in your life. They are a constant source of pride and joy, and the delight they bring you is incomparable. But even though it’s so very easy to love them, it’s not always as easy to come up with the perfect message to wish them well on their big day. 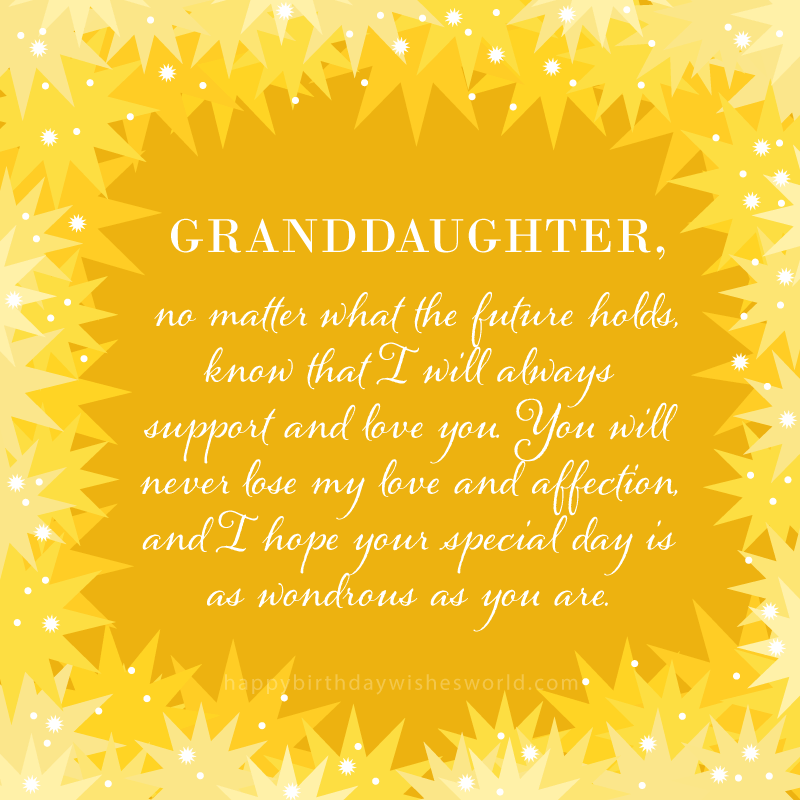 That’s why we’ve put together this list of birthday wishes for granddaughters. So, from toddlers to teenagers here is a list of ways to say happy birthday Granddaughter. Granddaughter, I hope that your birthday is every bit as darling as you are. May it be filled with unparalleled happiness and a lifetime’s worth of laughter and love. Happy birthday to the world’s greatest granddaughter! You always manage to fill my life with your positivity and love. I hope that you receive it back ten-fold on your special day. May you have a blessed day, and more importantly, may your presents be just as plentiful as your love is. Your determination and strength inspire me, but it is your unconditional love that warms my soul. You are unbelievably precious to me, and I hope that your birthday is everything you want it to be. I hope that this upcoming year will be as phenomenal as you are. May it be prosperous and full of nothing but joyous moments. Happy birthday to my amazing granddaughter! You deserve nothing but happiness, joy, wonder, and delight on your big day, Granddaughter. I sincerely hope that you receive lots of cake, presents, and love this year, and every year after. Granddaughter, you manage to be so many things all at once: intelligent, strong, beautiful, kind, and sassy. The thing I love most about you, though, is how loving you are. Thank you for filling my days with your smiles and laughter. Happy birthday to my delightful granddaughter! Your rambunctious ways may drive your parents crazy, but they make me feel young and carefree again! I hope that you never lose your taste for adventure and that your birthday is as epic and daring as you are. Happy birthday to my little spitfire of a granddaughter! I feel like your birthday came by so fast, Granddaughter. It seems like only yesterday you were a baby, but now you have already grown into a splendid young woman. I hope you know that I am always proud of you and that I wish you untold peace and happiness on your birthday this year. May your cupcakes be full of sprinkles, your presents full of money, and your heart full of love. No one deserves it more than you do. 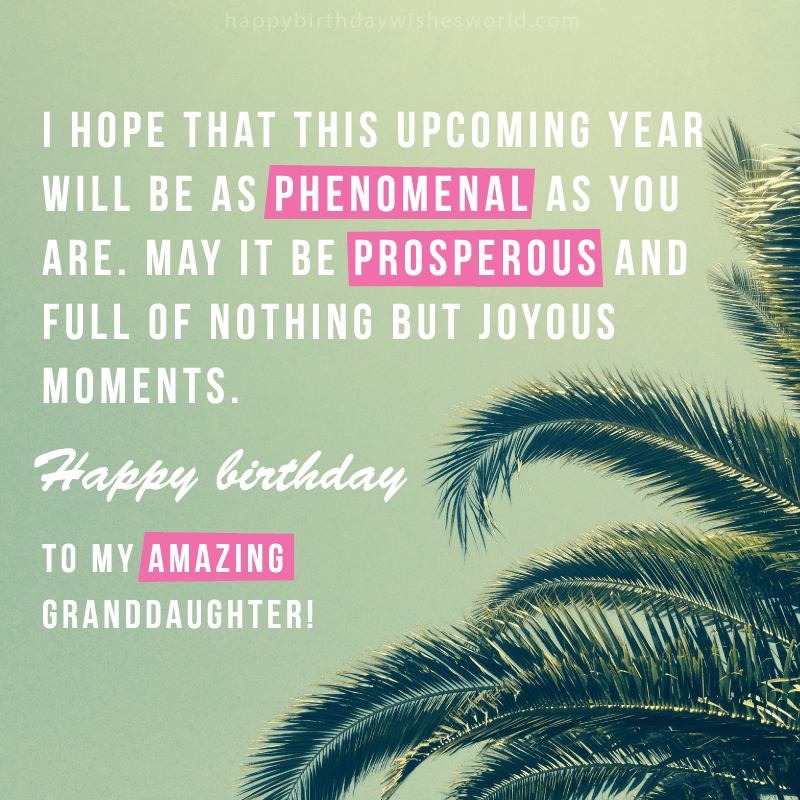 Thank you for always being such a loving granddaughter, and I hope that you have a phenomenal birthday this year. I thought I had everything I could ever need, and then you were born. It was then that I realized how much I needed you in my life. You have brought me so much happiness, and I hope that your big day is filled with just as much wonder as you have brought to me. Happy birthday Granddaughter! Granddaughter, since the moment I first saw you, I knew that you were someone special. You are an incredible person, and I will be forever grateful that you came into my life. May your birthday be full of delightful moments, precious gifts, and amazing people. You always shine brightly to me, but today you seem to shine even more so. I am so happy that I get to have a whole day to celebrate how truly fantastic you are. Happy birthday Granddaughter! May your special day have sweet moments, sweet cake, and even sweeter people because you are such a sweetheart! Thank you for being a sweet, kind, loving, and incredible granddaughter. Forget mother-daughter bonds, because there is no bond like the one that grandmothers and granddaughters share! You are my everything, and I hope you know that you can always count on me for love and support. May your birthday be as memorable as you are. Granddaughter, you’ve made my twilight so much more enjoyable. No, not Twilight the movie! Twilight as in my later years. Although, I’m not completely unhappy that you made me watch that movie, because everyone could use a little bit more sparkle (and Edward) in their life! Your birthday always serves as a reminder of all the wonderful times we have had together. Nothing has brought more contentment into my life, than having such a fabulous granddaughter. May your every hope, dream, and wish come true this year. As you celebrate another milestone in your life, I hope you always remember that you are loved and adored beyond measure. May your day be filled with joy, your year with serenity, and your life with love. Thank you for improving my life with your thoughtful, caring, and loving ways. You have brought nothing but happiness into my life since the day you were born. I sincerely hope that your birthday is chock full of wonderful moments. You are worthy of that and so much more. Granddaughter, I absolutely love you to pieces! You are an amazing person, and I am beyond fortunate to have you in my life. May your birthday be just as perfect as you are to me. Your cuteness brightens my day, your laughter warms my heart, and your love makes me eternally happy. Thank you for being the kind of person who makes me unbelievably proud to call you my granddaughter. Happy birthday! I hope that you never stop believing in yourself because I never will. I know that you can do anything you set your mind to because you are an exceptional person. May you receive all your heart desires on your big day, and hopefully, it will be half as amazing as you are to me. Granddaughter, you are a lot like sugar: super sweet, sometimes sticky, and absolutely addicting! Thanks for sweetening my life with your adorableness, and may your cake be even half as sweet as you are. The very best granddaughter deserves the very best well wishes on her birthday. I sincerely wish you all the best not just for your birthday, but for the rest of your life as well. I love you so much, and I unbelievably proud of who you are. Happy birthday to my loving granddaughter! Granddaughter, you have so many wonderful attributes: you are kind, loving, funny, daring, sweet, pretty, smart, and flat-out amazing. I am as certain that you will have a spectacular birthday as I am as certain that you inherited all these qualities from my side of the family! I realized today that I don’t tell you often enough how much I love you. You inspire me with your love, and I want you to know that no one else could ever compare to you. May your day be filled with endless moments of bliss. Happy birthday to my loved and adored granddaughter! The day you were born, my life became a little bit brighter. You brought sunshine, warmth, and love into my life, and I will always be thankful that I have such a splendid granddaughter. Granddaughter, I wish you nothing short of unbelievable joy for your birthday and your life as well. May you only know peace and happiness, and may your cake be even bigger than you are! You have grown into such a wise, witty, and wonderful person. You also seem to be a little bit wacky! You probably got that from me. I am so sorry, but happy birthday anyway! Know that you can always turn to me for guidance and support. I will never turn you away or judge you because you are my everything. 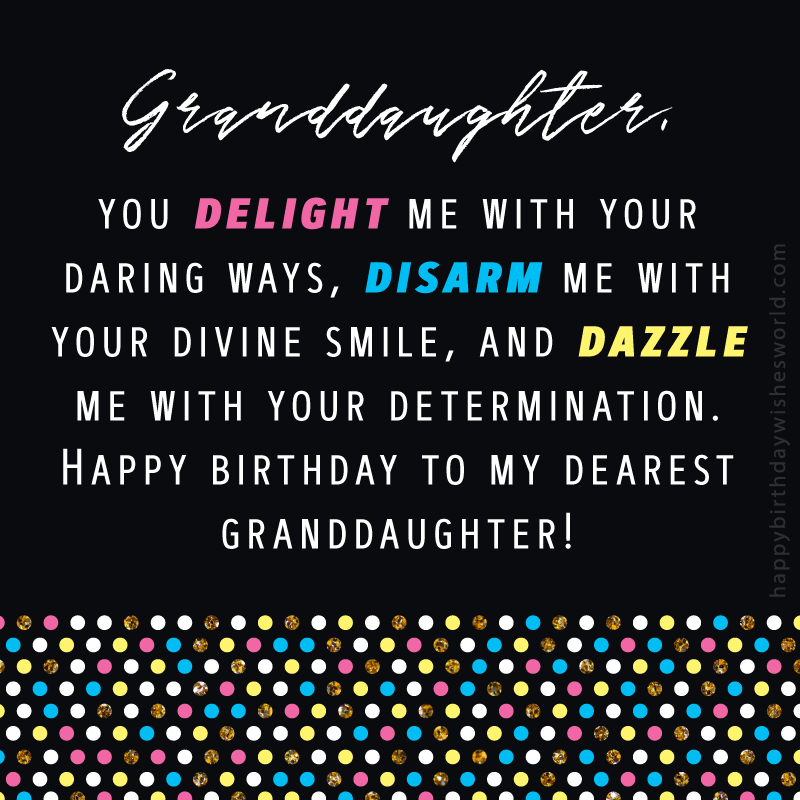 I am so happy that I get to call you my granddaughter, and may your birthday be every bit as lovely as you are. Granddaughter, you are such a delight, and I hope that you feel surrounded by love and affection on your special day. May it be full of positivity, laughter, joy, and love. Happy birthday Granddaughter! Your birthday always reminds me to take a moment to appreciate all the time I have been able to spend with you. I have so many terrific memories of us together, and I am comforted by the fact that there will be many more to come. Happy birthday to my cherished granddaughter! May you always succeed in all you do, and more importantly, may your achievements bring you joy and happiness. You deserve this and so much more in life because you are simply amazing. I know that we don’t get to see each other often, but I hope you know that you mean so much to me and that I love you. May your birthday be spectacular and your year even more so. Granddaughter, I want you to know that I wish you every joy not just on your big day, but for every day after as well. May your life be filled with spectacular moments, amazing people, and unconditional love. Happy birthday to the best granddaughter in the whole wide world! I know that you probably wanted cool toys for your birthday, but you will just have to settle for warm hugs and wet kisses instead. I am just kidding! I brought toys too because you deserve to have everything on your special day. Happy birthday to my adorable granddaughter! Know that I will always hold you near and dear to my heart, Granddaughter. You have enriched my life with your grace, courage, intellect, and love. May your big day be full of glee and gaiety. Granddaughters as amazing as you deserve to have every dream come true: Giant cake. Check. Lots of presents. Check. Surrounded by your loving grandparents. Priceless. Happy birthday Granddaughter! You make my life better merely by being in it. Thank you for making it easy to love you. Your kind nature, beautiful mind, and loving soul make me so grateful that I am a grandparent. I hope that your special day turns out to be as charming and spectacular as you are a person. Every day I thank my lucky stars that I was blessed with such a wondrous granddaughter. The day you were born was one of the greatest days of my life, and I hope that you know I love and adore you. I wish you love, bliss, peace, and happiness on your birthday. Now that you have begun the next phase of your life, I hope that only happiness and contentment await you. May it start on your birthday and never end. Happy birthday to my lovely granddaughter! Your birthday makes me reflect on all that I am blessed to have in life: a loving spouse, wonderful children, and a precious granddaughter. Thank you for being beautiful, thoughtful, and downright delightful. I hope your birthday is as exuberant as you are. Granddaughter, I hope that you remember to stay strong. This year may not have gone exactly as planned, but with grandparents who love and support you as much as we do, next year can only get better. May your birthday be the start of a bright and wondrous year. Happy birthday! I have loved you from the moment you were born, and that love has only grown stronger over the years. I am incredibly fortunate to have a cute, sassy, and lovable granddaughter like you. While I wish I could be there in person for your big day, I hope you know that I am there in spirit. May your birthday be full of fun and delight. Happy birthday to my sweet granddaughter! Granddaughter, when I think of you, I am filled with love. Your sincerity touches my heart, your honesty earns my respect, and your positivity brightens my day. I hope that your birthday brings you half as much bliss as you have brought into my life. Happy birthday! No matter what happens in life, I will always support, guide, and love you. You will always have a home to come to, a shoulder to lean on, and someone to love you. May your life be full of merry moments, fabulous food, awesome adventures, and precious people. Granddaughter, you are sweeter than your cake and more priceless than all your gifts combined. I hope that your birthday party is as fun, epic, and amazing as you are. Happy birthday! People always say you are gorgeous, talented, caring, and incredibly lovable, and I always tell them that it’s because you take after me! May your birthday be sheer perfection this year. When you smile, you light up my life. Thank you for always amazing me with your ability to love endlessly and unconditionally. You have made my life all the better by being in it, and I hope that you have a brilliant birthday full of marvelous moments. Thank you for always making me feel loved. You have no idea how much it comforts me to know that you will always be a part of my life. I hope that you have a splendid birthday. Granddaughter, it has been an absolute joy watching you grow up. Nothing has made me happier than getting to see all that you have accomplished in your life. May it continue to be as wonderful as it is now, and may your birthday be as astounding as you are. Every time I think back to our time spent together, it brings a smile to my face. You always know how to liven up my day, and I am so lucky that I have such a joyous granddaughter in my life. There is no present that I could give you for your birthday that could ever hope to encompass all the love I have for you because it is endless and eternal. I wish you every joy for your birthday. Granddaughter, no matter what the future holds, know that I will always support and love you. You will never lose my love and affection, and I hope your special day is as wondrous as you are. Granddaughter, if you always do your best, then I could never ask for more. I promise that someone as kind, smart, and funny as you will do well in life. Especially, since I will always support you no matter what you do. Happy birthday to the best granddaughter ever! When you were born, my life instantly improved. You have brought sweetness, meaning, and love into my life. I hope that your special day is remarkable, delightful, and downright magical. I tried to think of the perfect gift for you this year: a toy, a movie, a game, a kitten…. But nothing could ever hold a candle to the gift you have given me: the love of a granddaughter. So, I settled for a kitten. It’s cute and will annoy your parents. This is what I can a win-win. Happy birthday Granddaughter! Granddaughter, you fill my world with lots of laughter and love. You have touched my life in ways too numerous to count, and I am all the better for it. May your birthday be even a measure of how truly amazing you are, and may it also be full of peace and happiness. The moment you came into my life I decide to forgive your dad for all the angst he caused me as a teenager. If he can produce someone as cute and adorable as you, then I can let him slide. But even though I have forgiven him, feel free to give him some sass for me from time to time! I am so grateful for all the pleasant and refreshing surprises that you have brought into my life. I hope that your big day is filled with unforgettable moments of bliss. Happy birthday Granddaughter! Granddaughter, please don’t tell your mom, but you’re smarter, prettier, and quieter than she was at your age! Let’s keep this our little secret, though. May your day be as angelic as you are. Every time I look at you, there is no doubt in my mind that you got all your amazingness from me. You are welcome, and I hope that your special day is amazing as well. Happy birthday! You may no longer be my only granddaughter but know that no one could ever take your place in my heart. I promise that my love is limitless, and I will love you forever. May your birthday be radiant like you, and may you receive untold glee and happiness this year. As your grandparents, we only have one wish in life: that you grow up happy, healthy, and loved. We can take care of happy and loved, so you just try your best to stay healthy. Happy birthday, sweetie! Every time I think about your birthday, it always reminds me that if you weren’t born, then my life would have been the worse for it. Thank you for being such a sweet, affectionate, and caring person, and may your big day be full of many delights and joys. You deserve them! Granddaughter, not only do you glow more brightly than diamonds or pearls, but you are worth more than them as well. Your value is incalculable, and I truly hope that your birthday is all that you could ever expect and more. May every wish you have come true this year. May your birthday be as filled with hope, wonder, joy, and love as you have brought into my life. Although, that’s a tall order, so I wouldn’t count on it! But I will hope for it anyway. When I think of you, I am filled with immeasurable pride. You have turned into a magnificent woman who I am lucky to call my granddaughter. I hope that your birthday is filled with only happy moments, delicious food, and loving people. Happy birthday, Granddaughter! Thank you for always making me feel young at heart and keeping me on my toes. You may be hard to handle, but because I love you, I will call it vivaciousness instead. Happy birthday Granddaughter. Nothing elates me more than being able to share time with you. Well, maybe getting to enjoy your birthday cake! But time with you is in my top three for sure. Happy birthday! Granddaughter, I hope that every moment of your birthday is as awesome as you are. Remember that all the moments you have now will be precious memories later in life, so enjoy them to the fullest! 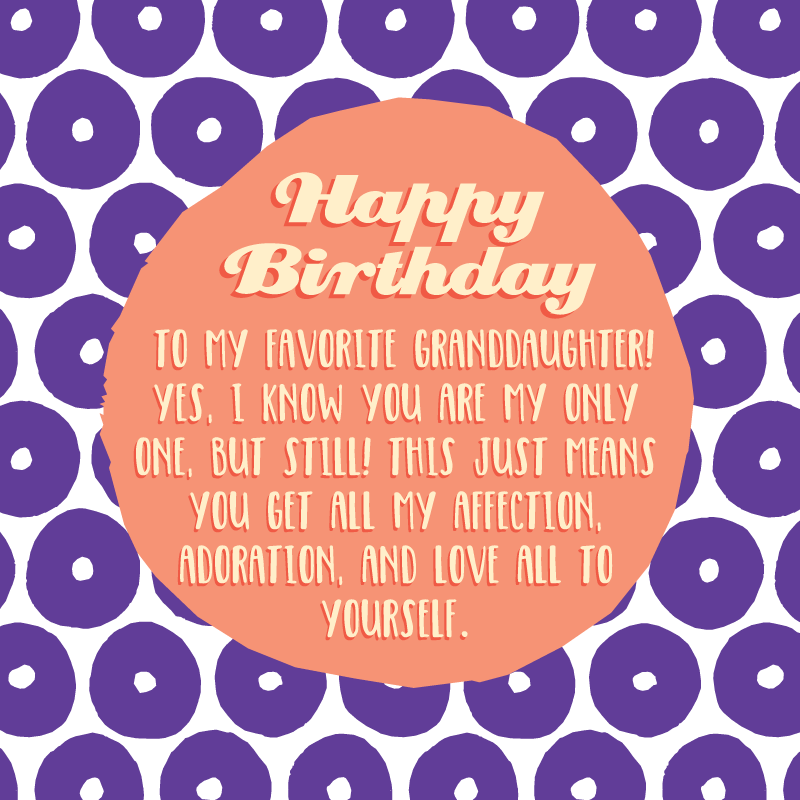 Happy birthday to my granddaughter who always knows how to make me feel good about myself! If you keep on telling me how handsome, young, and smart I am, then I will keep on spoiling you rotten. That’s what Grandads are for after all, and you make it very easy to do! Having a marvelous granddaughter like you is a constant reminder that we did a pretty good job raising our kids. Glad to see they learned a thing or two from us because you came out simply amazing. Granddaughter, now that you have stepped into adulthood, there are so many things I want to share with you. The most important is to always love whole-heartedly. If you ever need an example, just look to me, because I always love you whole-heartedly. Happy birthday! It’s your birthday, and I am as sad as I am happy. I am sad because I am getting older, but happy because it’s another year I get to spend with you. May you always feel cherished and loved until the end of your days. Happy birthday to my favorite granddaughter! Yes, I know you are my only one, but still! This just means you get all my affection, adoration, and love all to yourself. Even though distance may separate us on your birthday, know that love will always bring us closer. I love you so much, and I hope that your big day is filled with a big cake and even bigger presents. Granddaughter, you are my joy when darkness surrounds me, and nothing brightens my mood or day more than time spent with you. May you always be as cheerful as you are now. You have a plethora of good qualities: you are kind, gentle, thoughtful, warm, and caring. None of these make me prouder than the fact that you are loving as well. May you always feel appreciated and adored, and may your birthday be as fantastic as you are. This may be just another birthday for you, but for me, it’s another excuse to have a whole day to celebrate your being born. 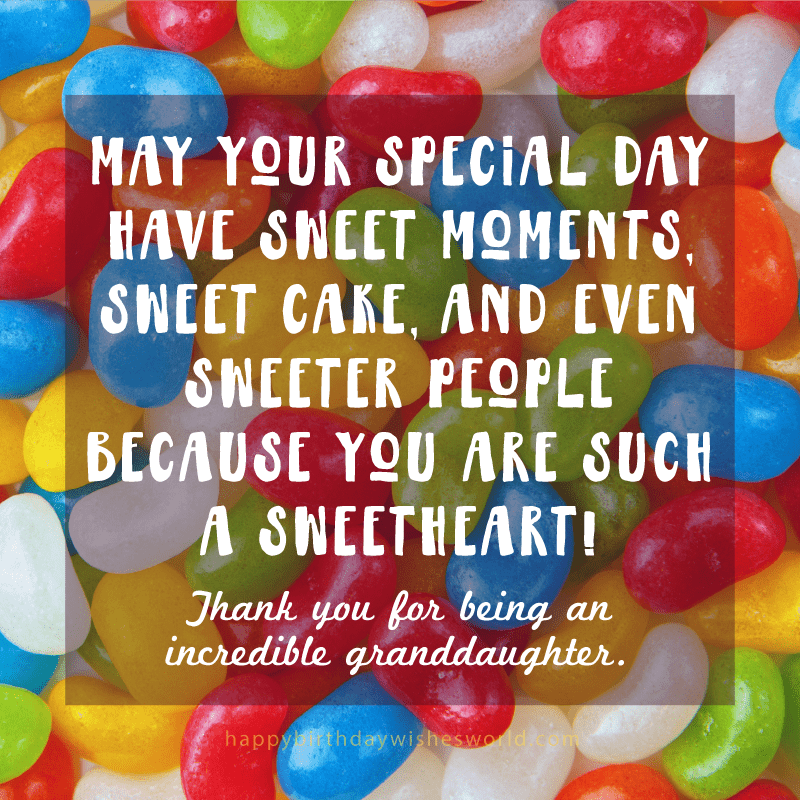 I am so thankful that you are my granddaughter, and I hope your special day is as lovely and bright as you are. Happy birthday to my beloved granddaughter! I hope that you never stop believing that you can achieve your dreams, Granddaughter. Someone as determined, strong, intelligent, and energetic as you can do anything she sets her mind to. Also, I’m pretty sure that you got all these traits from my side of the family! I hope that you have a blast on your birthday because you are dynamite! Hopefully, the only explosions will be ones of laughter though. Happy birthday to my little firecracker! Granddaughter, I hope that your birthday will be the start of a fantastic adventure and that you never lose your way in life. If you do, call me, because my job will always be to guide you. Don’t let your dad know but you are way cuter than he was at your age! Maybe that’s why I love you more. I’m just kidding. Or am I? Happy birthday to my cutie-pie granddaughter! May your birthday be filled with even a small bit of the joy, happiness, and love that being with you has brought to me daily. No one can bring a smile to my face faster than you can. Granddaughter, you will never stop being my little princess, and I will never stop being your Fairy Godmother. As your grandmother, it’s my job to fulfill all your wishes, and I hope that your birthday is filled with lots of magic and wonder. Happy birthday Granddaughter! Your bright eyes and glowing smile never fail to dazzle me. Thank you for brightening my world, and may you always shine as brilliantly you do now. Happy birthday to the light of my life! I hope that you never lose your compassion, your kindness, or your humility. These traits are hard to come by nowadays, and I am beyond proud that you have turned into such a lovely young woman. You have made me so very happy and joyous. Nothing brings a smile to my face more than your adorable presence. Thank you for making it so very easy to love, cherish, and adore you. May you have an extraordinary birthday this year. You are a good person, a wonderful daughter, and an incredible granddaughter. I hope that your birthday is full of many blessings. Happy birthday to my extraordinary granddaughter! Granddaughter, your smile, laughter, and hugs are what I live for. I am so fortunate that you came into my life and infused it with your affection and love. May your day be as stunning as you are. When I look back on my life, the times when you have told me “I love you” have been some of the greatest moments of my life. You may never know how much you mean to me, but I hope that you at least know how much I love you. Happy birthday! It’s amazing how one person has had such a large and positive impact on my life. Your love gives me so much peace, and I hope that your special day contains even half the joy you bring me. You have us wrapped around your finger, Granddaughter. But that’s okay because we don’t mind. Nothing gives us more pleasure than caving to your every demand. Well, maybe annoying your parents. Happy birthday from your loving grandparents aka your faithful servants! May your day be full of laughter, giggles, and love. No one is more deserving of a marvelous birthday than you, because you are everything I could ever wish for in a granddaughter. At my age, birthdays aren’t really a cause to celebrate anymore, so let me remind you to enjoy yours while you still can. May you always feel as young as you do now, and more importantly, may you always feel as loved, protected, and adored as you do now. Granddaughter, you are never too old to be treated like a princess by your grandfather. Know that I will always be your knight who will come to your rescue if ever you need me. I promise that there is no dragon I will not slay for you. Happy birthday to my enchanting granddaughter! May you always be successful and triumphant in life. This shouldn’t be too hard for you since you are an amazing person. Your grit, resolve, and determination surely came from me! 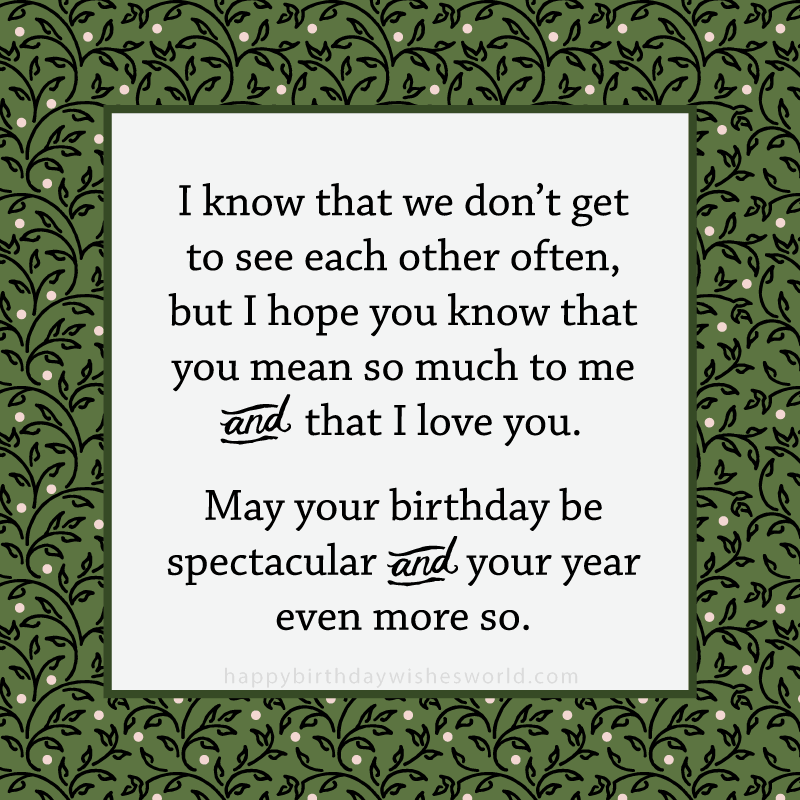 Even though I can’t be there on your birthday, please know that I am thinking of you on your special day. I miss you so much, and I promise that I will make it up to you. Prepare for a big cake, a shiny present, and a warm hug when I return. When I look back at all the fun times we have had together over the years it truly warms my heart and soul. Thank you for being a bold, brainy, and beautiful granddaughter. I love you. Granddaughter, you are cuter than tiny bunnies in tiny cups. I don’t know how you ended up that cute, because you clearly didn’t get it from my side of the family tree! Thank you for being such a sensational granddaughter and imbuing my life with your love and compassion. Happy birthday to the source of my greatest pride and joy: my darling granddaughter! You are a lovely, kind, and downright lovable person, and I am eternally grateful that you were born. May your cake be as sweet as you, your presents as shiny as you, and your day as pleasant as you. I hope that your big day is filled to the brim with laughter, happiness, and delight. My world became a lot nicer the minute you entered it, and I want you to know that you are truly and deeply loved. Granddaughter, I pray that throughout your life you only know the joy and elation that I have known since the day you were born. You are truly special, and I hope you have a great birthday. I know the perfect gift for an adorable granddaughter like you: lots of squishy hugs! Don’t worry I also came prepared with Barbie and cupcakes just to be safe. But I know deep down you prefer my hugs. Happy birthday to my dearest granddaughter! Granddaughter, you delight me with your daring ways, disarm me with your divine smile, and dazzle me with your determination. Happy birthday to my dearest granddaughter! May you always have the strength and self-confidence to chase after your dreams, because no one is worthier of attaining them than you. Thank you for always making my days happier and brighter with your presence. Being with you always makes me forget how quickly the years have passed by. You make feel young again, and I am truly fortunate to have such a loving granddaughter. I hope that your birthday is every bit as glorious as you are. Happy birthday Granddaughter! Granddaughter, may you always love yourself and live life fully. I promise that when you are older, you will be so grateful that you did. You can trust me because since I’m older, I know. You have so much fire and spirit, and I hope that you never lose it. Have a wonderful birthday. The day you came into my life was one of the happiest days I’ve ever known. You’ve changed my life for the better, and I can’t even imagine not having you as my granddaughter. May your big day be every bit as full of hope, grace, and love as you are. Happy birthday Granddaughter! I want you to know that there is nothing I would not do for you and no obstacle I cannot overcome for you. I love you very much, and I hope that you have a superb birthday, a stunning year, and a spectacular life. You fill my life with joy and wonder, and you are the reason I have known so much happiness in my life. Your kindness, strength, and generosity always inspire me. Happy birthday Granddaughter! Granddaughter, you may be small, but your impact on my life has been huge: hugely satisfying! I am so happy and thankful that you came into my life because you have made it so much better with your smiling face, kind words, and loving embrace. I am so grateful you were born, because now your parents get to know all the headaches I went through. Mwahaha! Just kidding. I am so grateful that you are an amazing person. And if your parents happen to struggle, then that is just icing on the cake! You may take after your parents in looks, but you certainly take after me in attitude! I am so glad I passed on my sassiness to you. May you always keep that inner fire, and may you outshine all your candles this year. Happy birthday to my saucy granddaughter! I wish you the best of luck and fortune on your special day. May it be as fun as you are and as endless as my love for you. Thank you for being the best granddaughter I could ever hope to have. Granddaughter, it has been a pleasure watching you grow and bloom over the years. You are turning into such a beautiful young lady, and we are so proud of you. Happy birthday to our little flower! True, your parents have really done a lot of amazing things over the years, but nothing can ever compare to them having such a wonderful daughter. You are the best present I have ever received, and I want you to know that I appreciate you so very much. Happy birthday to one of the greatest gifts I have ever received in life: my precious granddaughter. Nothing gives me more joy than being enveloped in your love. I hope that your special day is perfect because you certainly are. Since the day you were born, I’ve only grown more and more fond of you. You have a way of making everyone around you happy, and I am no exception. Thank you for making my world better with your adorable and loving self. Happy birthday Granddaughter!